A commander from the Russian Caucasus known as Omar al Chechen has formed Jaish al-Muhajireen wa Ansar, or Army of the Emigrants and Helpers, and integrated several Syrian fighting units into the ranks. Abu Omar was the commander of the Muhajireen Brigade, which fights alongside al Qaeda’s affiliate in Syria, the Al Nusrah Front. The creation of the Army of the Emigrants and Helpers was announced on March 26 by Kavkaz Center, a propaganda arm of the Islamic Caucasus Emirate, an al Qaeda-linked jihadist group in Russia’s Caucasus. “In March 2013, a unit of Mujahideen of Kataeb al Muhajieen, or Brigade of Emigrants, under the command of Omar al Chechen was joined by several brigades of Syrian Mujahideen, including Kataeb Khattab, or the Brigade of Khattab, and Jaish Muhammad, or the Army of Muhammad, after which it was decided to reorganize the structure of Kataeb,” Kavkaz Center reported. “As a result, Jaish al Muhajireen wa Ansar, or the Army of Emigrants and Helpers, was created,” Kavkaz Center continued. Kavkaz Center claimed that the Army of Emigrants “has more than 1,000 Mujahideen, Muslim volunteers from different countries, including the Caucasus Emirate,” who “are fighting under its banner.” The claim appears to be true; just one week ago, a Swedish fighter known as Albu Kamal As Swedee was reported to have been killed while fighting with the Muhajireen Brigade. A video showing Syrian jihadists swearing an oath of loyalty to Omar al Chechen, who is seen in the background, was also published on YouTube. 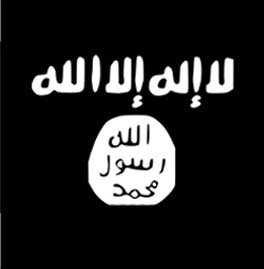 Hundreds of jihadists are seen in the video, and some are flying al Qaeda’s flag. 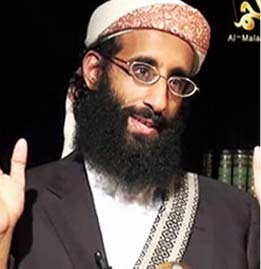 Saifullah also said that no distinctions should be made between the different theaters of the jihadists’ war. “To us, there is no difference between Syria, Egypt, Iraq, Afghanistan, Chechnya, the Caucasus, any place,” he said. Another video shows the takeover of a military base in Handara in Aleppo. Again, al Qaeda’s banner is shown flying in the background. Omar al Chechen first appeared in a videotape that was released by Kavkaz Center on Feb. 7 [see LWJ report, Chechen commander leads Muhajireen Brigade in Syria]. 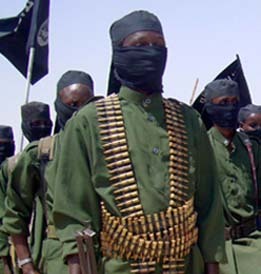 He was seen surrounded by 19 heavily armed fighters and seated behind al Qaeda’s flag. “Chechen fighters,” often described as fighters from the Caucasus and southern Russia, have been spotted on the Syrian battlefield for months. In October 2012, a group of “Chechen emigrants” is known to have fought, along with an element from the Free Syrian Army unit, under the command of the Al Nusrah Front to take control of a key Syrian air defense and Scud missile base in Aleppo. The Long war Journal speculated at the time that the group included members of the Islamic Caucasus Emirate [see LWJ report, Al Nusrah Front commanded Free Syrian Army unit, ‘Chechen emigrants,’ in assault on Syrian air defense base]. 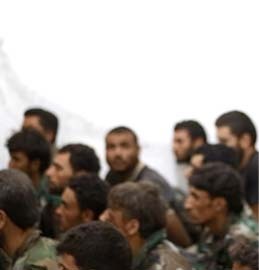 The Muhajireen Brigade is known to have participated in two other major assaults against Syrian military bases since the October operation in Aleppo. 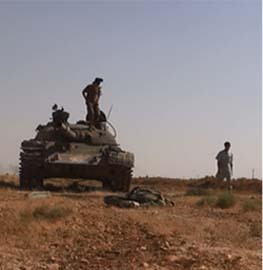 In mid-December, the Muhajireen Brigade teamed up with the Al Nusrah Front to overrun the Sheikh Suleiman base, or Base 111. 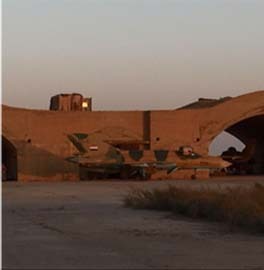 Arab and Central Asian fighters are reported to have participated in the battle. And in mid-February, the Al Nusrah Front, together with the Tawhid Brigade and the Muhajireen Brigade, stormed the base of the Syrian military’s 80th Regiment (or Brigade), which is situated near the main airport in Aleppo in eastern Syria. Doku Umarov, the emir of the Islamic Caucasus Emirate, has praised the “mujahideen” in Syria as well as the fighters from the Caucasus. In November 2012, Umarov released a speech on the Kavkaz Center website that addressed the jihad in Syria. “I appeal to the brothers, and I want to stress that we, the Mujahideen of the Caucasus, pray for you, make Dua [supplication to Allah], ask Allah to help you with His angels, that Allah helps you in every way,’ he said. Umarov was added to the US’s list of Specially Designated Global Terrorists in June 2010. The US added the Islamic Caucasus Emirate to the list of Foreign Terrorist Organizations in May 2011. It boggles my mind that the U.S. state department is funding these savages. Yes Assad is a bad guy, but there is absolutely no hope for any sense of democracy to take root in Syria. Stop funding these terrorists and let this thing inch along at a slow destructive pace. Libya, and Egypt show that once the savages take contol of the country they immediately turn on the U.S. while holding out their hands for more money. What a waste of this country’s treasure. I wonder how deeply ‘infiltrated/penetrated’ these Muslim Caucasus groups are by Russian Intelligence? I feel your frustration because it’s painfully obvious we still haven’t learned our lesson from all the ‘blowback’ we received from the Afghan-Soviet war from 1979-1989. We are definitely playing the ‘game’ though when it comes to funding specific rebel groups within this region of conflict. The Chechens are a fascinating group. There has be a distinguishing factor between the Chechens who choose to stay and fight for the separatist causes in the Caucasus and those who wish to travel abroad to fight along side insurgent groups primarily in Afghanistan, Iraq (primarily Fallujah), and now Syria. It seems that the Chechens who are fighting in the Syrian conflict come from the upper echelons of the Chechen command in Chechnya, especially Abu Omar al-Checheni since fighters are swearing allegiance to him; he must have unshakable, proven ‘jihadi’ credibility. The Chechens who travel to fight, in my mind, are essentially ‘jihadists’ of fortune; the small constituency of Chechens who partake in resistance love to fight, bottom-line. It seems they are usually dispatched to fronts of conflict where ‘Muslims are suffering at the hands of the Jews, Crusaders, and Apostates’ to offer their training services (as was the case in Fallujah, Iraq 2004) as well as to assume upper echelon leadership roles. Yes, there are obviously religious reasons to why the Chechens may travel to regions of conflict to participate in battle, but I feel that the religious rhetoric just adds to the myth of why ‘jihadists’, and Chechens when focusing on this article, participate in insurgencies. Chechens go where the money is, and the money will not only fund their newly minted Syrian groups, but money will also be sent back to its constituency in Chechnya to continue the separatist resistance against Russian forces. INteresting bit here: Washington (CNN) — A former U.S. soldier has been arrested and charged with illegally using a weapon of behalf of an al Qaeda-affiliated group in Syria. Not to defend the competence of the US State Department, but where do you get that they are funding these groups? It wouldn’t surprise me, but I would like a reference to point to. It boggles my mind that the U.S. state department is funding these savages. Actually, Washington has very carefully abstained from providing any military support to any rebel group in Syria (let along foreign Jihadists). However Saudia Arabia, Qatar and Turkey have been much less spendthrift. I guess abu omar al-chechen is still alive afterall and it looks like he is doing pretty well for himself. Is there a possibility of seeing some kind of chart of jihadist groups and their leaders on the LWJ Bill like you did with TTP, shabaab and others? It can be the same case as Iraq-Iran war were you want both the sides to lose. Is it possible? The Agency sent millions of dollars (along with eventually the infamous stinger missiles) to rebel groups throughout the Afghan-Soviet war (1989-1990), but the money was left in the hands of ISI (Inter-Services Intelligence) in Pakistan to distribute the money to whoever they wanted really. The Agency supposedly did this to hide American involvement from Russia. After the Afghan-Soviet war subsided, the United States essentially turned its back on the political future of Afghanistan, which then the civil war within Afghanistan began to heat up. As far as the creation of the Taliban, Pakistan is responsible for that as well as millions of dollars from Saudi Arabia. The money was essentially used to build madrassas that would incubate Talibs who were indoctrinated into a ‘Wahhabi-Deobandi’ hybrid religious ideology. Keep in mind that this was a quick gloss over of how the Taliban was formed as I’m sure I left out numerous other facts, but I hope you get the gist dude. @my2cents, not sure how credible the Guardian is in your estimation, but anytime I see “non-lethal” aid going to any war zone, it means what ever cause is being supported can focus their existing monies on weapons and fighters. There are other findings described as aid and support to the rebels from CIA, and other agencies as well, but not sure how “support” is defined. Did we get blowback from supporting the Muj, the wrong factions or not taking an active interest after 1991 or there abouts? By interest I mean caring about the actors (including money). The war against the Soviets was won, the money taps turned off. So it was only Iranian, Pakistani & Russian money supporting the various factions. Did we support the Lion of Kandahar or anyone else after 1992? We did not for the most part even look on as the Pakistanis recruited, trained & funded the Taliban. The Pakistanis do what they want to do, but we do or did have some leverage with them. The Taliban were created by the Pakistani ISI, because they want some control over Afghanistan. Not only as Americans do we have the disease that the war is won let’s demobilize, but too many of us don’t give a damn about the countries in the War zone. We did in Afghanistan what we did in Europe after WW2. We left a war ravaged place & demobilized. The Marshall plan came 2 years after the war’s end in 1947. It was 2 years late. In Afghanistan we never came back in time to prevent crap like 911 from happening. The ability to sustain this war as long as possible, is in the best interests of the “west” and certain area nation states. The more casualties on all sides is less warriors for the Global Jihad. The people of Syria, will not see a land free of despots, for some time. It has more to do with the surrounding regional “players” and their desires as well as global powers. The power vacuum of Northern Africa is only enhanced by the ability of weapons available from the defeated regimes. These minor wars (low intensity conflicts) will persist for generations. It remains to be seen how the US responds to these challenges. I am not hopeful. Obama had to put the brakes on his own advisers who kept pushing him to support these guys. The NSC just recommended that we give direct aid to the rebels including body armor and night vision goggles – which he rejected. The $60 million that he did authorize includes 200,000 MREs that are set to expire in June. Hopefully they had pork in them. The U.S. is the largest provider of humanitarian aid to Syrian refugees at almost $500 million. It looks like the British and French will, in fact, provide direct, ‘non-lethal’ aid to the rebels in the form of body armor and night vision goggles. Let the Saudis and Qataris handle the arms supply. Btw, we didn’t create the Taliban – that was Pakistan. And we have no obligation to be involved in any nation once our objectives are met. Our support for the Muj against the Soviets was a win-win-win all around. We defeated the Soviets, Pakistan defeated Afghanistan and created a vassal state, and the Muj got the money and weapons they begged us for. How many countries have been destroyed even worse than Afghanistan, such as Vietnam? Did any of them fly planes into our buildings? Holding people accountable for their actions is important. In the case of 9/11, I hold Pakistan directly responsible b/c the Taliban was their proxy group. The notion that states can establish proxy groups like Hezbollah or the Taliban or LeT and use them to project power has to stop. We need to go to the source… and that source in Afghanistan is Pakistan. Real men want to go to Tel Aviv! This is a better summary than I could ever give in regards to defining ‘blow back’ in the American context referring to our covert involvement in Afghanistan (1979-1989). I think also Bergen alludes to how ‘blow back’ is somewhat defined, but also ‘blow back’ I think has multiple contexts outside of American convert involvement in the Afghan-Soviet conflict; by this I mean American foreign policies that formulated after the Afghan-Soviet conflict resulted in ‘blow back’ as well. Therefore, my argument, agreeing with Peter Bergen, would be that the Afghan-Soviet conflict was the beginning, a starting point at which the idea of ‘blow back’ began to take shape and eventually becoming a full-circle realization within the intelligence community on 9/11. If I remember correctly, the US intelligence community began reaching out to Ahmed Shah Massoud (this is the Lion your referring to right?) and the Northern Alliance in the late 1990’s as bin Laden began to gain global notoriety with his ‘fatwas’ against the United States and the East African embassy bombings in 1998. If you want some good references, you should check out Steve Coll’s book ‘Ghost Wars’. I think Mike Merlo needs to face facts, it is interesting that Chechen Islamists at the height of the conflict with central forces from the Russian Federation – that Chechen Islamists had bases, funding and escape routes in both Georgia and Turkey. Now, I wonder which nation is very close to Turkey? Also, with regards to blow-back; then Bosnia is also a chain within the September 11 and Madrid loop. what facts are you talking about? Since when have opposing Forces not sought to infiltrate each others ‘infrastructure?’ I guess you aren’t familiar with any of the “Green On Blue” killings that have taken place in place in Afghanistan. I guess NAZI infiltration’s in the Battle Of The Bulge never took place. The attack at Fort Hood was just an aberration or in your case one of mistaken identity. “The supposed bomber at the center of a foiled plot to bring down a jetliner was actually a double agent who funneled vital information to U.S. and Arab intelligence agencies, according to officials, marking an apparently successful infiltration of al Qaeda’s most dangerous branch. The above 2 paragraphs courtesy of The Wall Street Journal. This is unlikely. Syrian groups are under the thrall of the Saudi-Wahabi Caliphate (i.e. “Al Qaeda” which was merely a US funded and aided Staff College for Islamic Terror, since disbanded)and the proposed actualization of the Islamic Empire mandated in the Quran as the word of “God” by “his prophet”. While there are individual students (taliban) and mercenaries (sultans) who are recruited into the ranks of Islamic Terror, Chechens, like Kurds are more about sovereignty and independence and are viewed with suspicion by genuine Islamic movements such as are taking over Turkey and ruling Saudi and Pakistan. If, in the quest for independence, they have, generically, embraced the promise of the Saudi-Wahabi-Caliphate, this would be a very dangerous shift of demographic tectonics against the forces of liberal democracy and human enlightenment. The primary danger to world peace, liberal (secular) democracy and human emancipation remains the members of the Anglo-American elites who have been purchased, and are nurtured and maintained by the Saudi-Wahabi Caliphate since before the Bombing of Belgrade and who deflected the “Coalition of the Willing” to Iraq from the Islamic “sword arm” Pakistan after the invasion of Afghanistan to bog down and neutralize the NATO nations in the coming era of Islamic aggrandizement. It truly boggles the mind to believe that Americans are so uninformed and uneducated in events unfolding in the middle east. We have a president which announced that Al Q is dead, and now supports the very people that Al Q are using to overthrow the Syrian government….the Muslim Brotherhood. Even today I briefly listened to a broadcast from one of the major networks mocking the chants heard from the video that was on the computer of the deceased older brother saying that the man was obviously crazy. I find it truly amazing that the media would rather avoid the reality of what’s happening in the middle east all to protect an incompetent president.